Perhaps the best part of this work is that one can pick it up and, with a few quick page flips, enjoy entire stories replete with Twain’s delightful quips and puns. Because the narrative, as it were, remains a collection of disconnected anecdotes, readers easily can pick up and put down the book as necessary — read a passage or two before bed, say, or sneak in some satire during the lunch break. That does not mean this book is not scholarly. It is. The editors have taken pains to footnote and cross-reference, to contextualize and explain. One wonders whether Twain would have appreciated the academic flavor the editors have given the book, but then again, Twain probably would’ve been happy just knowing that he’s still in the limelight, still drawing chuckles from the masses and bashful blushes from the smug and pious. One thing, libertarians, is for sure: Twain did not share a Kinsellaesque disdain for intellectual property rights, as made clear by the 100 year freeze on the publication of this autobiography. IP notwithstanding, perhaps the most libertarian thing we can say of Twain is that he was a rugged individualist whose political inconsistencies reflect freethinking rather than commitment to groupthink or sycophancy. There is, I think, much wisdom to be had in Twain’s go-it-alone style. Twain, like Ayn Rand, Robert Louis Stevenson, and Jack London, is one of those figures that the intelligentsia cannot seem to bury or dismiss despite concerted efforts to do so. Many a critic has condescended to Twain’s work only to make himself look, well, foolish. That’s because the homespun and folksy Twain packs quite the intellectual punch with his powerful and conversational prose. And because, even in death, Twain speaks to us like a redneck rascal who is, despite himself, smarter than us all. 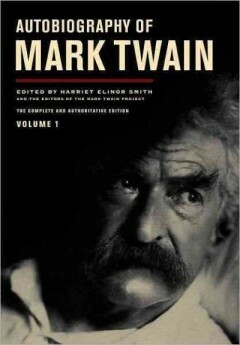 In an age when canonicity is considered dubious, Twain persists in the American imagination as a literary giant. Faulkner called Twain the “father of American literature.” If Faulkner was right, then we owe a great deal of thanks to the editors of this volume, which tells us much about our father — who probably ain’t in heaven — that we did not know before. Kudos to the editors, and thanks above all to you, Mr. Twain. Wherever you are. It was well worth the wait. Allen Mendenhall is a writer, attorney, editor, speaker, and literary critic. He is managing editor of the Southern Literary Review and has been an adjunct legal associate at the Cato Institute as well as a Humane Studies Fellow with the Institute for Humane Studies in Arlington, Virginia. He is the author of over 100 publications in such outlets as law reviews, peer reviewed journals, magazines, newspapers, literary journals and periodicals, and encyclopedias. He lives in Auburn, Alabama, with his wife, Giuliana, and son, Noah.